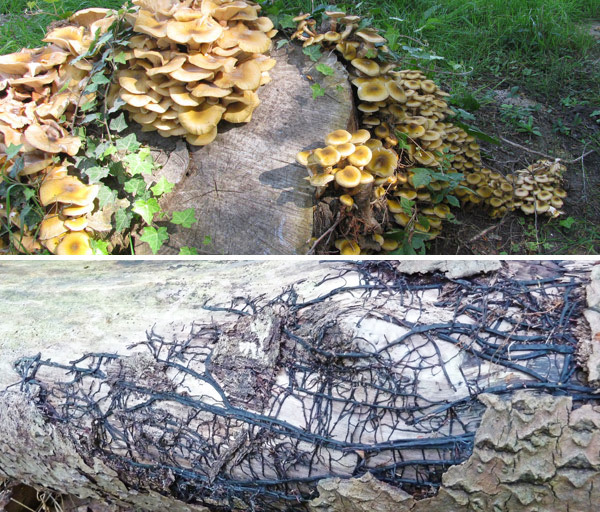 A good year for Dryads Saddle – Best Bracket Fungus? 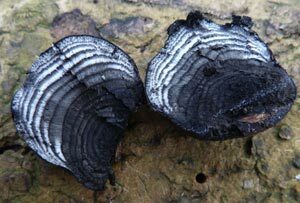 One of the most common bracket fungi found in the UK also happens to be one of the largest. And they’re out in force! The beautiful Dryad’s Saddle or Pheasant Back Mushroom (Cerioporus squamosus) can put on some dazzling displays. They are often grouped in tiered columns on deciduous trees and stumps. They’re actually a parasite, causing severe white rot. Once the tree is dead they become saprobic and slowly begin to decompose the wood, that’s why you often find them on tree stumps. This season in particular has been very good for these giant bracket fungus beauties. They fruit in spring and summer (sometimes into early autumn) and going by how many emails I’ve received about them this year, they are in plentiful numbers all over the UK. Oh yes! You can read more about this fascinating fungus on my previous post ‘Dry Saddle for the nymph!‘, albeit the featured specimens there were much older than those shown here, it actually is testament to how big they can get. Here you will also find the link for a simple but delicious recipe I discovered on YouTube. Definitely worth a go. 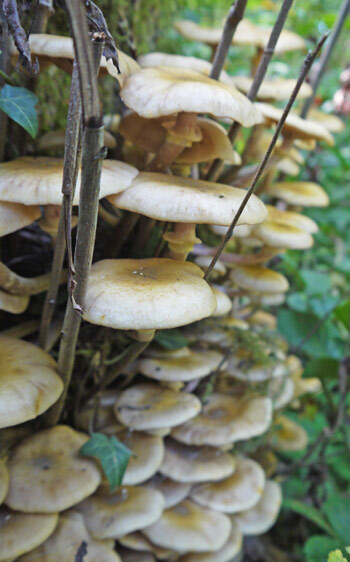 Also check out the Forager Chef – Dryads Saddle, it covers some useful tips for preparation, recipes and preserving. Good stuff. 5-60cm across. Fan shaped. Top side is ochre/cream (maturing darker) with darker brown concentric fibrous scales. Flesh up to 4 or 5cm thick. White and succulent when young (tougher and dry when older). Strong ‘mealy’ smell. 3-10cm x 6cm laterally attached (often off-centre) blackening towards the base. Parasitic then saprobic on deciduous trees and old stumps. Edible and good when young and fresh. 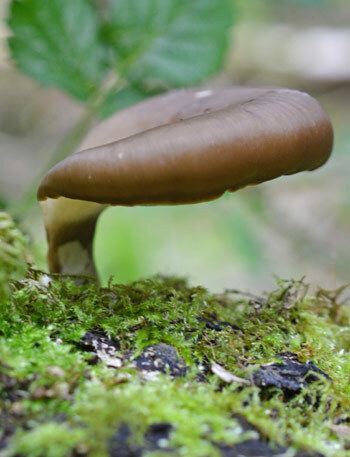 • Nearly all are bracket fungi, but a few are with typical cap and stem. They have pores (holes at the end of tubes in the flesh) instead of gills on the underside. • Usually tough/leathery or hard and woody (usually softer when young). 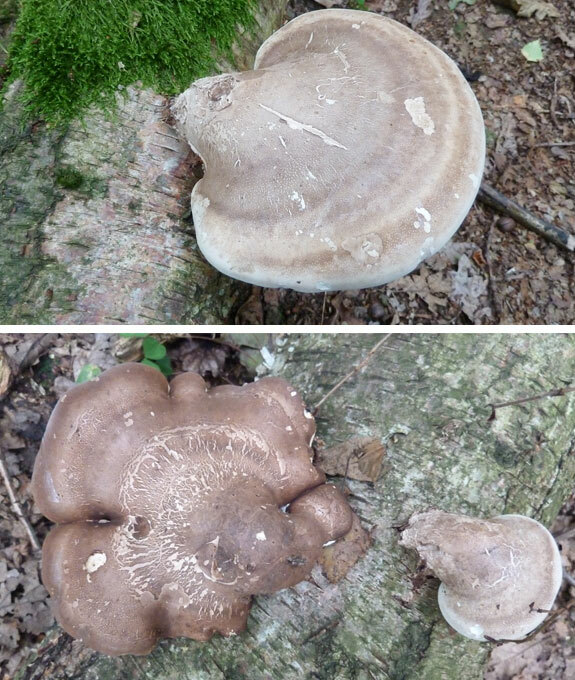 https://i0.wp.com/www.mushroomdiary.co.uk/wp-content/uploads/2018/06/Dryads-Saddle-on-tree-stump.jpg?fit=1230%2C551&ssl=1 551 1230 J C Harris https://www.mushroomdiary.co.uk/wp-content/uploads/2015/10/mushroomdiary-logo-2015-small.png J C Harris2018-06-12 13:11:202018-06-22 09:33:19A good year for Dryads Saddle - Best Bracket Fungus? A trip to a relatively close wood nearby produced some interesting finds for me. Many of which were quite small – but always fascinating. And what with the recent hot weather and the odd overnight downpour, my path through the woodland was swarming with hundreds of mosquitos. I took quite a few bites home with me that day! 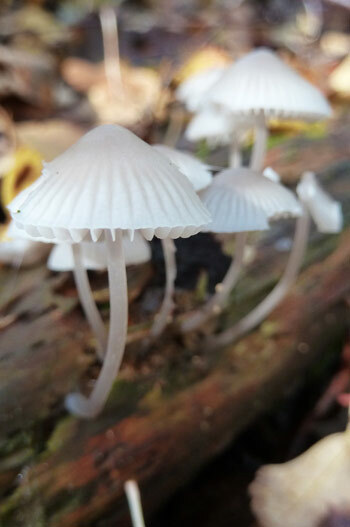 However, it was worth it eventually to find a small trooping group of Collared Parachutes (Marasmius rotula) just off the beaten path enjoying the conditions on some decaying wood. Even when grouped together, they’re not that easy to spot as the cap only reaches up to 1.5cm across, but are usually slightly smaller. Once discovered though, you’ll notice their appearance is very unique. 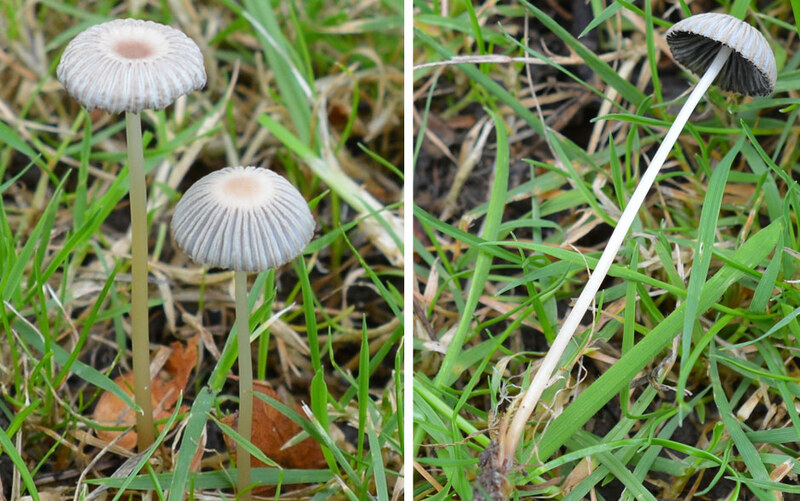 This Marasmius species is a prime example of displaying the ‘parachute-like’ shape of the cap. 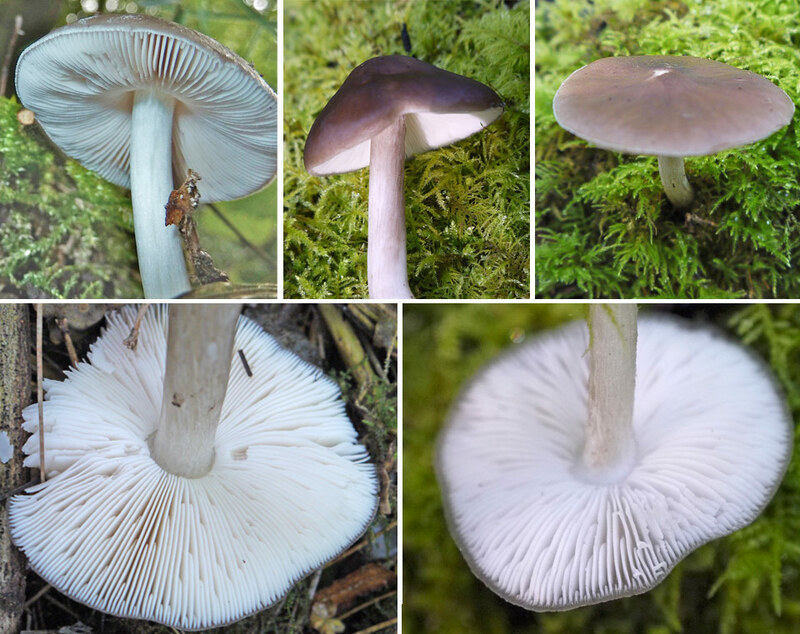 Initially, the bright white cap is strongly convex and flattens out and often becomes duller with age. The distinctive ribbed surface however, keeps its shape. Mirrored underneath these ribs and grooves are the widely spaced white gills which are attached to a small central collar that is free from the stem – another distinctive feature of this species. 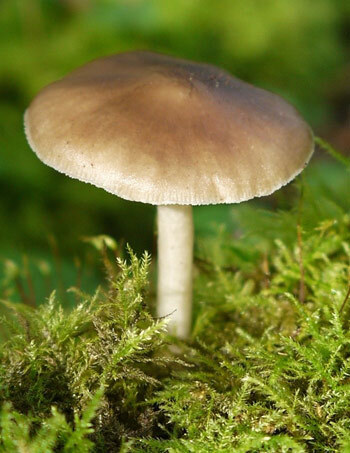 The stem is very thin and fragile but can be very long in relation to the size of the cap. 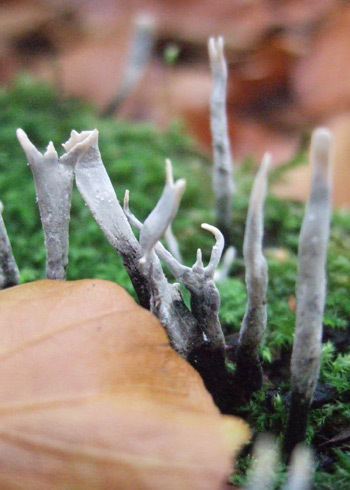 At about 1mm thick, it can stand up to 7cm tall from the mixed substrate of dead wood, twigs and roots on the ground. This group were taking up residence at the base of a rotting log. 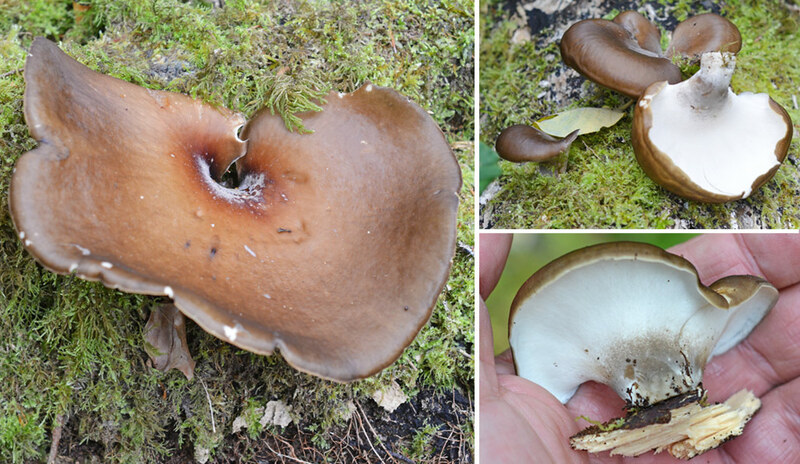 The stem is paler at the apex where it meets the cap but much darker further down towards the brown/black base. Keep an eye out for them this summer (and all the way through to early winter). Also, if the conditions are warm, take some mosquito spray, or if you have a smart phone there’s actually an App that repels mosquitos. Weird! The Collared Parachute – Notice the ‘parachute-like’ appearance of the cap and the widely spaced gills attached to a central collar which is free from the stem. 0.3 – 1.5cm across. Convex/rounded. Central depression. Flatens out. Parachute shape, white (Becoming brownish with age). 2-6.5cm x 0.1cm. Whitish at top. Darker brown/black down towards the base. White or Pinkish. Very distant. Connected to a central collar free from the stem. Grows on dead wood (preferably deciduous). Also twigs, roots and sometimes leaves. Summer – winter. Not edible. Too small and insubstantial. 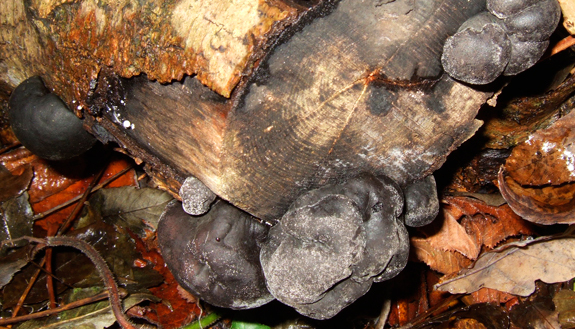 This is one of the common fungus sights around. 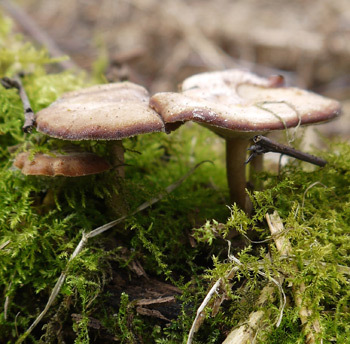 In fact it is one of the most commonly recorded fungi in Britain. 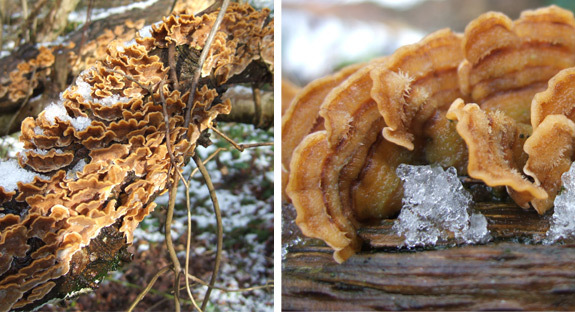 I’m talking of course of the Hairy Stereum or Hairy Curtain Crust (Stereum hirsutum). You’ll find it layered on the dead/fallen wood and stumps of deciduous trees – and it’s appearance is all year round. Shame it’s too tough and leathery to even think about putting in the pan! Damn! So what’s this ‘hairy’ business all about then? Well, on initial viewing you don’t notice, but on closer inspection you can see many hairy tufts along the upper side. And as a bit of extra trivia, hirsutum in latin means hairy. 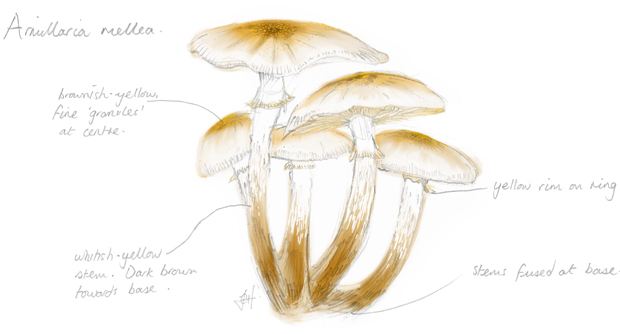 The brighter yellow/orange lower surface, which is smoother, releases the spores. When older, this underside fades to a dull grey/brown. So to sum up – If you haven’t seen any of these yet – you’re on the wrong planet. And yes – they’re inedible. Seen all year round – Typical rows of the orange/brown wavy fungus Stereum hirsutum.